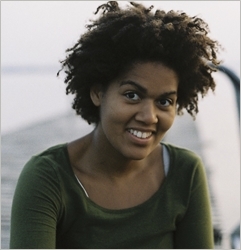 Thabi Mooi (1983) graduated from the Theatre Directing School in Amsterdam in 2012. Since her graduation, she has created various location- specific performances. To touch the eyes, ears and hearts of people she combines film, audio and music in her work. She places her stories in a wide landscape, in order to show the frail relationship between people and their environment. The themes of 'migration' and 'rooting' derive directly from Thabi's personal background. She was born in Angola, as a daughter of a South African father and a Dutch mother, who lived in exile for a large part of their lives. In 2016, Thabi founded her company Homunculus in Amsterdam, which has the ambition to portray humanity in all its diversity. By sharing stories from people and cultures around the world, exploring the common roots of human existence, Homunculus wants to connect people in a human and artistic way.